The Model 51X156 12-Pin Socket is a surface or DIN-rail mount socket. This unit is used for Time Mark Corporation models 261XBXP and 261XBXPR Alternating Relays. UL rates the compound material used on the 51X156 at 140C or 284F. 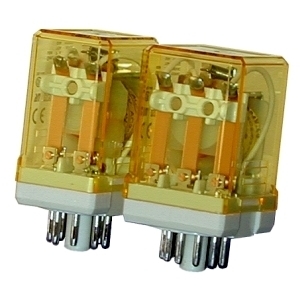 Terminals are #6-32 screws, and are suitable for use with wire sizes up to two #12 AWG and rated up to 600VAC. The Model 51X156 is UL Recognized, CSA Certified, and CE (European Conformity) Accepted.